Ganoderma lucidum is the first ever mushroom known to be used for health benefits. For thousands of years, it has been used in Asian medicine. Also known as Reishi or Lingzhi, the mushroom grows naturally as a parasite on trees in the tropics and temperate zones throughout the world. It feeds off dead leaves of maple, oak and other broadleaf trees. With growing scientific research, the mushroom’s medicinal qualities are now being increasingly recognized in the west. Ganoderma lucidum has been used as a medical remedy in China, Korea, and Japan for centuries. This edible mushroom is considered to preserve human vitality and to promote longevity. Ganoderma lucidum functions as a preventive medicinal herb. It works to aid the body’s immune system, as well as the overall health of our internal organs. It acts as an anti-fungal, anti-hypotensive, antiviral, and anti-inflammatory agent. It also functions to block the spread of tumor or cancerous cells as a part of its anti-tumor properties. In addition, herbalists use Ganoderma lucidum to treat various diseases, including allergies, arthritis, bronchitis, gastric ulcer, hyperglycemia, hypertension, chronic hepatitis, hepatic disease, insomnia, nephritis, scleroderma, inflammation, and cancer. It also has systemic benefits in treating tumors, detoxifying the body through liver cleansing, as well as treatment for heart disease. Its antioxidant properties allow it to reduce the signs of aging, and it also treats hypertension. Ganoderma lucidum contains more than 200 active elements. The most frequently occurring active elements in Ganoderma lucidum include polysaccharides, organic Germanium, Adenosine, Triterpenoid, and Ganoderic Essence. These active compounds help in boosting the human immune system. They do so by strengthening lymphocytes and macrophages, important immunity cells. Besides organic Germanium, Triterpenes and polysaccharides can also enhance the composition of Lymphocyte and Macrophage cells individually to release Tumor Necrosis Factor (TNF) and interferon, which further destroy cancer cells. Research has proved that Ganoderma Lucidum herb effectively increases alpha interferon and gamma interferon level in the human body to further strengthen and regulate its immune system. Blood pressure: Studies have shown that Ganoderma Lucidum inhibits platelet aggregation thereby reducing blood pressure. In studies of people with hypertension, researchers found blood pressure was significantly reduced over a two-week time with reishi supplementation. Immune system: Ganoderma Lucidum is commonly prescribed by practitioners for long-term immune system support. Studies have shown that after taking Ganoderma Lucidum for thirty days, patients with advanced tumors found a marked immune-modulating effect as demonstrated by an increase in T-lymphocytes and decreased CD8 counts. Researchers have also reported reduced side effects of chemotherapy or radiation as well as improved post-operative recovery. Blood sugar: Studies have shown Ganoderma Lucidum to have a blood sugar lowering effect. Much of this activity appears to be due its polysaccharides. There are three main mechanisms behind this blood sugar lowering effect. This includes Ganoderma Lucidum’s ability to elevate plasma insulin levels, to enhance peripheral tissue utilization of glucose, and to enhance liver metabolism of glucose. Anti-inflammatory effects: According to a December 2009 study in Current Pharmaceutical Biotechnology, Ganoderma has anti-inflammatory and immunomodulating properties, making it useful for treating chronic inflammatory and autoimmune disorders, such as arthritis. Anotehr study found that 50 milligrams of reishi powder had comparable effects to 5 milligrams of hydrocortisone, a corticosteroid used to treat arthritis pain and inflammation. Oxygenation: One of the unique uses of Ganoderma Lucidum is for altitude sickness. Reishi appears to reduce altitude sickness by oxygenating the blood. This benefit was first found in Asian mountain climbers that ascended mountains as high as 17,000 feet with minimal reaction. 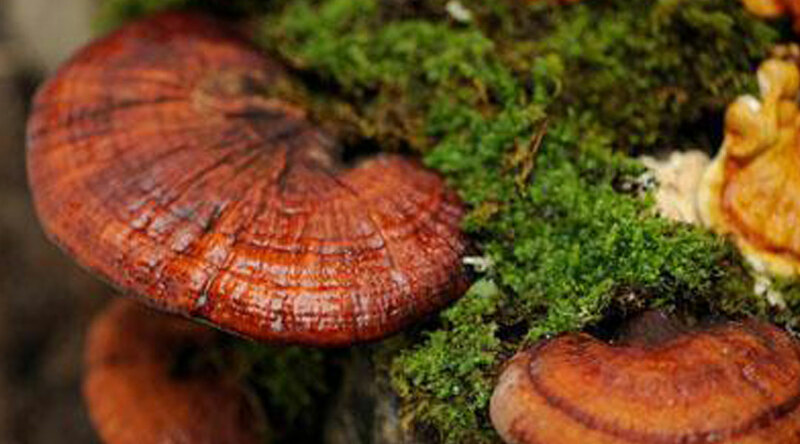 May prevent cancer: Ganoderma Lucidum herb is high in Organic Germanium, Triterpenes and polysaccharides. These active components strengthen the immune system. The active components of Ganoderma Lucidum herb work to strengthen T-lymphocytes and macrophages, key immunity cells. In turn, these immunity cells act to destroy abnormal cells like cancer cells, and so it may help in the prevention and treatment of cancer, although more research is needed. Immune system health: Studies have shown that Ganoderma Lucidum also contains polysaccharides, which help to strengthen your immune system, and may help slow the aging process. Neuralgia and insomnia: Pharmacological research shows that Ganoderma Lucidum herb has a calming and sedative effect on the nervous system. It is, therefore, particularly effective in the treatment of neuralgia and insomnia. In addition, using this herb for nerves can also help you to improve sleep and appetite, enhance energy, improve memory, and regain vitality. Heart-related diseases: Ganoderma Lucidum contains the active element Triterpenes, which can improve blood circulation and significantly reduce the amount of fatty substances such as cholesterol and triglycerides. This, in turn, helps to prevent heart disease, hypertension, hardening of the coronary arteries, and other coronary heart diseases. Other remedies: Besides preventing diseases, Ganoderma Lucidum has hyperglycemic and anti-inflammatory effects that are particularly effective in treatment of chronic maladies such as high blood pressure (hypertension), diabetes, headache, kidney and liver problems, etc. Abnormal bleeding: Ganoderma lucidum contains an active ingredient called adenosine that can inhibit platelet aggregation and it may also affect the clotting ability of thrombin in veins. As a result, there is a blood thinning effect, which may eventually lead to the inability of a wound to close and heal promptly. Talk to your doctor if you are taking blood-thinning medications. Low blood pressure: Because of its hypotensive effects, the Reishi mushroom can interact with blood pressure medications. Some people have reported dizziness and light-headedness, as a result of taking Ganoderma. Talk to your doctor if you are hypotensive or taking blood pressure medication. Stomach upset: This is the one of the most common side effects, and can include stomach pain, nausea, vomiting, and diarrhea. Liver damage: One of the relatively rare but major Ganoderma lucidum side effects is its potential to cause damage to the liver. Two patients, one in Hong Kong and the other in Thailand, where use of the mushroom is widespread, developed liver hepatitis after taking concentrated lingzhi powder, and this lead to their deaths. Do not take the any form of reishi mushroom if you have liver disease. Other side effects: Allergic reactions can cause dizziness, dryness of the mouth, throat, headaches, mild irritation of the skin, which may manifest as skin redness and rashes. Currently, there is insufficient information to know whether it is safe to consume Ganoderma lucidum when pregnant or lactating, so best to avoid in these states. Ganoderma is one of the oldest known herbal medicines. Herbalists use it for allergies, arthritis, bronchitis, gastric ulcer, hyperglycemia, hypertension, chronic hepatitis, hepatopathy, insomnia, nephritis, neurasthenia, scleroderma, inflammation, and immune system health. To use the mushroom, chop &frac12; ounce of the dried mushroom into tiny pieces, or measure &frac12; ounce of the powdered herb, and put into a bowl. Then add three cups of cold water. If you are using the powder, you can drink as is – one cup three times per day. If using the dried mushroom, let the cold water and mushroom combination sit for two to three hours before slowly bringing to the boil. Simmer for 45 minutes, cool and then strain. Drink one cup three times per day. Enjoy and toast your own heath! What’s The Hype Around Hemp Oil?